In the frame of http://mayofsolidarity.org/ we will organise protests and civil disobidience simultanously in various European cities in front of Apple stores. We will denounce Apple as profiteer of the global chains of exploitation, as symbol of “modern contract manufacturing” benefitting from the global wage hierarchies. The current crisis policy involves austerity programmes in Europe with the result of redistribution of wealth from bottom to top, that forces more and more people into precarious labour contracts. But in the same time the aggressive crisis policies aim to extend and intensify immediate conditions of exploitation in the global production. Apple is one example, this company no longer runs production sites itself but has its iPhones and iPads produced by contract manufacturers such as Foxconn that operate at low wages in world market factories in China and elsewhere. Apple provides design and technology, Foxconn organises the industrial production for Apple. With 1.3 million employees, Foxconn is both the world’s most important industrial employer and producer of more than 50% of all electronic products worldwide. Smartphones and tablets, notebooks, game consoles and workstations: All these devices are stained in the Global labour market with sweat and blood of mostly young, migrant workers who share – albeit in different forms – the blackmail of institutional racism that is functional to wages differentiation. They suffer exploitation in the production sites of the electronics industries in Asia, Latin America and Eastern Europe, in industrial labour camps characterised by humiliation, stress, shift work, low wages, despotic management, accidents at work and diseases. Yet, there is no room for such horrors in the medial versions of our digital world and even less in the popular advertising spots of Apple or Samsung. With his “Supplier Responsibility” policy, Apple – with the complicity of scholars from Stanford University, other educational institutions and audit groups – is trying to shift any accountability for the working conditions in the production chain towards supplier like Foxconn. 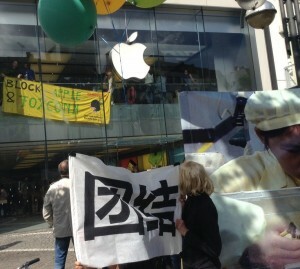 Apple discourse significantly aims to “conflict-free” factories. Yet we know workers are struggling, and we know Apple is the leading actor in the electronics market and production chain: the continuous release of new models and the extreme quality Apple seeks are only possible thanks to extreme exploitation. The credibility of the supplier responsibility policy is very low, and the independence of the audit process not proved. Apple, Foxconn, and other suppliers are all equally responsible for the working conditions. In our actions we want to address these structures of exploitation and at the same time draw the attention to the forms of resistance and refusal of the workers. In 2010, dozens of young Chinese workers fell to their deaths from Foxconn’s factory buildings. The suicides fueled more struggles and a wave of actions and strikes that in some cases forced Foxconn and other employers to raise wages. Campaigners from solidarity groups in China, Hongkong and other countries blamed tough working conditions and military management as reasons for the suicides. They also denounced that Foxconn has actively tried to divide and isolate workers in the factory halls and in their accommodations in order to prevent resistance. Yet, Foxconn’s world market factories have repeatedly witnessed strikes and riots that have received little attention so far. “Solidarity beyond borders” is one of our central slogans for the coming transnational actiondays in May. In Rome and Bologna, in Warsaw and Poznan, in Frankfurt and Dusseldorf, and perhaps in some more cities we will be active at 16th and 17th of May with simultanous actions: with authorized manifestations or spontanous go-ins, as announced sieges or as unexspected blockades in front of Apple stores and shops. According the respective conditions we will link these protests with local conflicts and struggles. We perceive our coordinated activities as an attempt to develop interconnected struggles on a transnational scale. No border, no nation – block exploitation!